Canada’s oldest museum is the Montreal Museum of Fine Arts. The museum can be found in the Golden Square Mile area on Sherbrooke Street. Over the years, it was expanded many times and today it exhibits a large collection that is displayed in several different pavilions. In 1860, a group of art collectors created an art association. The association organized art exhibitions, put together a permanent art collection, and also established an art school in the city. They raised money to construct a building for their art collection. For several years the association had trouble obtaining adequate funds for the building. In 1877, Benaiah Gibb gave the association a significant monetary gift, land and a large collection of paintings. In 1879, the first museum was completed and the art association acquired more works of art, including many paintings done by the students at the association’s art school. Later, many other private art collections were acquired, and in 1909, the art association made a decision that a bigger museum was needed. The new building was designed by architects William and Edward Maxwell. This museum has a marble facade that is white, an elaborate monumental staircase, a high portico, and low relief designs. The large exhibition rooms used almost all of the space, but there also is a library, lecture room, and art studios for students. This pavilion was completed in 1912, and originally it was named for Benaiah Gibb, but now it is named after the Hornstein family. In 1917, the decorative arts department was created, and by the mid 1930’s, that department featured many artworks from different artists. As soon as the collection was completely established, the association decided to give the museum a name that represented both decorative art and paintings. For this reason, in 1948 the official name became the Museum of Fine Arts. In the years that followed, additional artwork was added to the museum’s permanent art collection, including several contemporary works by artists from Canada. 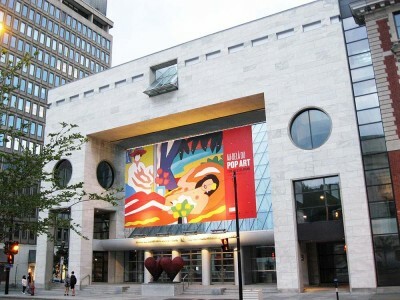 The Montreal Museum of Fine Arts was expanded during the mid-1970’s and once again in 1991. Architect Moshe Safdie, designed the Jean-Noël-Desmarais Pavilion in 1991. This modernist annex exhibits art from all parts of the world and is close to the 1912 pavilion. It has an interesting sloping glass roof, which provides sunlight for the public foyer. An underground tunnel connects the pavilion with the 1912 building. In 2007, the museum announced a new project to convert a Romanesque Revival church into the Canadian art pavilion. This church with Tiffany stained glass windows was built in the late 1890’s. The new pavilion opened in 2010 and it doubled the exhibition area for Canadian artists. It was named after the Bourgie family because of their outstanding financial support. The museum has a very extensive collection of artworks from all over the world. Its Inuit and Canadian collection features sculptures, woodcarving, and paintings. European artwork is also displayed from artists that include Picasso, Dalí, Rodin and Rembrandt. There are also art collections from North America.